This month, Keith Robinson finds a fitting memorial to the brave submariners of two world wars. The museum sits on a strange dog-legged parcel of the former HMS Dolphin, the shore base which was the home of the RN’s submarines from 1904 until 1999. The best place to start is in the Holland Gallery, specially built to house the salvaged and restored Holland 1, the RN’s first submarine. Not only is the actual submarine on display, but it is accompanied by a short series of panels that describe the historical developments that led to the creation of the world’s first practical submarine. Sections of the Holland 1’s hull have been cut-away to allow a view of such features as the 70hp electric motor. More exciting, there is access for visitors to explore the interior – but be warned, there is not much room! Its spartan interior must have felt extremely cramped for its eight-man crew. But it is the main engine dominating the aft, and the single torpedo-tube dominating the fore that reveal the submarine’s deadly purpose. Outside the building, next to HMS Alliance, is a replica of the oar-driven Drebbel I, an ancestor of the Holland’s. It was originally built for a TV programme exploring the viability of the boat designed by the Dutchman Cornelius van Drebbel for King James I around 1620 and demonstrated on the River Thames. The keynote gallery is the new £3.1-million John Fieldhouse Building, named after Lord John Fieldhouse, the late Admiral of the Fleet, and the RN’s most senior ranked submariner ever. He was also the Commander of the Task Force which recovered the Falkland Islands. The zinc-clad steel structure imitates the form of the latest submarines, complete with conning tower! The building’s primary purpose is to display and provide long term care for X-24, the only remaining example of a British X-craft midget submarine, one that saw service in WWII. It fulfils its purpose admirably, displaying the X-24 to the best of modern museum standards. It is cut away near the rear to allow visitors to see the cramped conditions in which its four-man crew worked. HMS X-24 weighed in at 27 tons, was 51ft long and 5¾ft across its beam, had a submerged speed of 6 knots, and a diving depth of 300ft. X-craft, though, had little range when submerged and were normally towed by a full- sized sub close to its target. Using this method, X-24 made two raids on the floating dock used to repair U-boats in Bergen harbour, occupied Norway’s most heavily defended port. There are many other things to see and do in the new building. 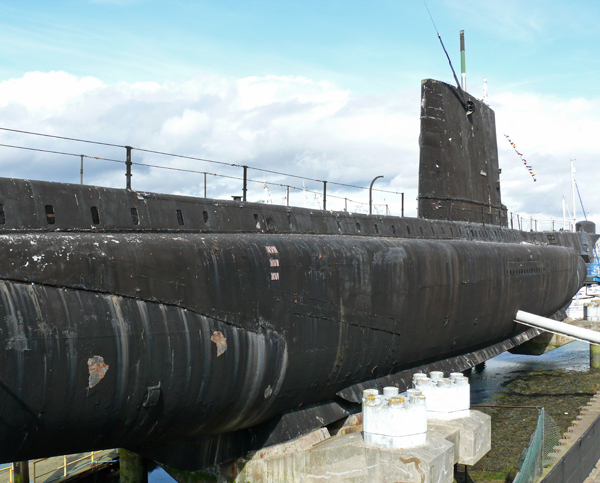 One of the most intriguing of these is to enter, and sit in the commander’s cabin of HMS Conqueror, the sub that sank the cruiser Belgrano during the Falkland’s conflict in 1982. A major attraction of a visit is the guided tour of HMS Alliance, commissioned in 1947, an Amphion class submarine designed as a long-range patrol boat. Modifications were made several times, especially in the late 1950s, when improved equipment was added for its new Cold War role. This primarily involved better streamlining and noise reduction, including the removal of its deck gun, as well as the addition of the very latest in sonar equipment. If that’s not enough, there are still a couple more exhibition halls at the other end of the site to explore. One of these contains an example of the German one-man submarine, the Biber, or beaver, with its fearsome painted shark’s mouth, carrying two externally attached torpedoes. Hurriedly produced in quantity near the end of WWII, design flaws and inexperienced operators meant an extremely high loss-rate. But high losses were the norm across all submarine services in both world wars. HMS Alliance is a fitting memorial to all the brave men who have fought in the dangerous world under the sea, and especially to the 5,300 British submariners who lost their lives there. Previous article Alexander the Greatest leader?